Background: Cancer is considered one of the most predominant causes of morbidity and mortality all over the world and colorectal cancer is the most common fatal cancers, triggering the second cancer related death. Despite progress in understanding carcinogenesis and development in chemotherapeutics, there is an essential need to search for improved treatment. More than the half a century, cytotoxic and cytostatic agents have been examined as a potential treatment of cancer, among these agents; remarkable progresses have been reported by the use of the snake venom. Snake venoms are secreting materials of lethal snakes are store in venomous glands. Venoms are composite combinations of various protein, peptides, enzymes, toxins and non proteinaceous secretions. Conclusion: Snake venom possesses immense valuable mixtures of proteins and enzymes. Venoms have potential to combat with the cancerous cells and produce positive effect. Besides the toxicological effects of venoms, several proteins of snake venom e.g. disintegrins, phospholipases A2, metalloproteinases, and L-amino acid oxidases and peptides e.g. bradykinin potentiators, natriuretic, and analgesic peptides have shown potential as pharmaceutical agents, including areas of diagnosis and cancer treatment. 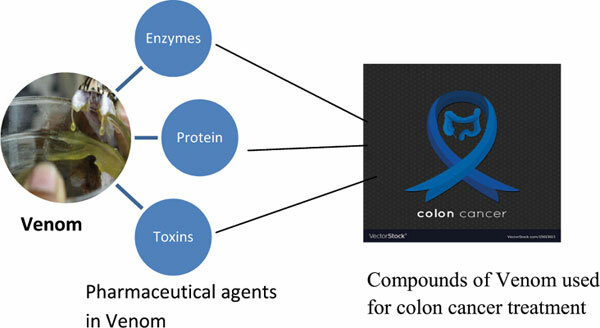 In this review we have discussed recent remarkable research that has involved the dynamic snake venoms compounds, having anticancer bustle especially in case of colorectal cancer. Venoms, toxic, cytotoxic, anticancer, colorectal cancer, cytostatic agents.